The original Kingdom Hearts was a masterpiece which linked two amazing universes by a wide gamut of magical doors... the world's of Disney and Squaresoft were now forever linked to feature one of the most unique and interesting storylines of all time. The sequel begins several years after the first events of Kingdom Hearts and Sora, Donald and Goofy return to continue the search for Riku and King Mickey, however things have become much more complicated than they expected. The heroes discover that the Heartless are still rampant in many worlds and Sora must use the keyblade to close the dark portals that let them in. As old adversaries return, new ones emerge with more mysterious intentions as a strange group named Organization XIII seeks to draw Sora into their fold by manipulating the strange creatures called Nobodies. Stranger still is that the members of this group seem to know Sora, however by a different name. Squaresoft have done a truly remarkable job at the presentation of this title with players being greeted to an almost three hour long prologue that reestablishes the characters and give a great snippet of the previous storyline. With that said, the introduction features some beautifully pre-rendered cinematics that nicely mesh with in-game graphics to truly give one of the most unique introductions in gaming history. 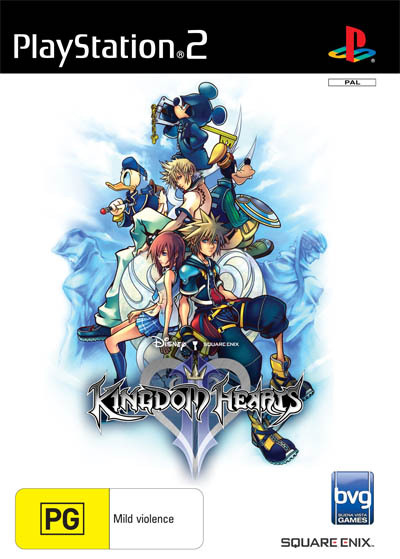 The gameplay of Kingdom Hearts II is similar to the previous title with gamers accepting a variety of quests from NPC characters and visiting a myriad of different worlds with their main goal of once again bringing order to this multiverse of worlds. Unlike the previous title, the accessing of worlds has slightly changed with gamers using the Gunmi Ship to enter these hidden worlds, however to make things more interesting, the player must battle their way through a Star Wars style shooter level. 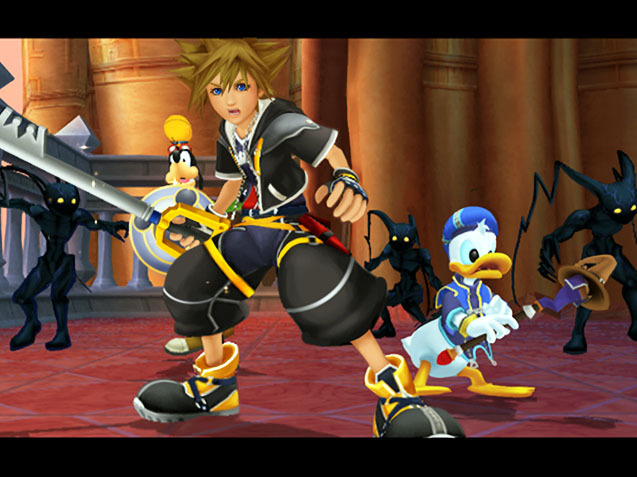 The control system of Kingdom Hearts II is relatively straightforward with the player using the left analog stick to control the characters, the right stick for the camera and the d-pad used to access items, attack or to use magic. The shoulder buttons are used for shortcuts and combat. Of course for the purpose of combat, the X button is the Holy Grail and is used to dispatch your enemies back to their own vile worlds. With combat, the summoning of monsters is an entertaining aspects of the game but with the ability to summon creatures such as Stitch and Chicken Little, it really helps immerse the gamer into the worlds of Disney and Squaresoft. Your main characters also have the ability to perform super moves, provided that your drive gauge is full and if it is, your enemies had better watch out. In its essence, Kingdom Hearts II is a role-playing game and as you complete quests and more specifically, defeat enemies, you gain more experience which in turn allows you to access more abilities. Even though the game has a set storyline for the main missions, the game also features dozens and dozens of mini-games to keep you entertained and coming back for more. Graphically, Kingdom Hearts II may look similar to the previous title but the developers have truly upped the ante in terms of the technical achievements of the game. The levels in the worlds are truly massive and feature quite a bit of background activity and whether you're in Mickey's Castle or the world of Hercules, it is almost as you have been transported into these amazing cartoons. Match that with realistic character design that pays homage to their original formats (whether television, movies or a video game) which move with a fluid like grace, it nicely comes together in what will definitely be the hit game of 2006. As with the graphics, the musical score of Kingdom Hearts II is fantastic that changes depending on the world you are visiting. 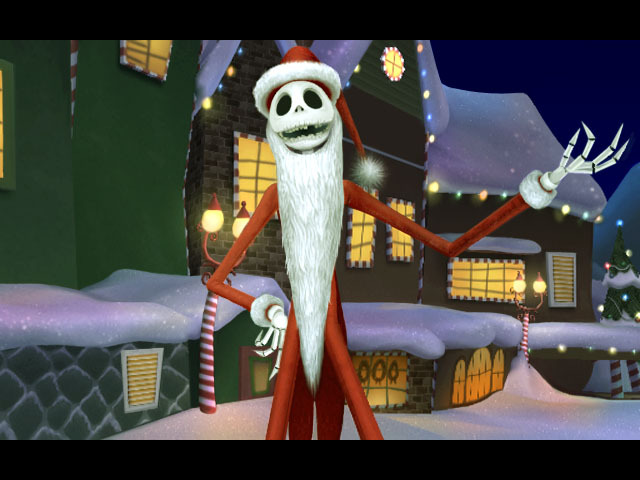 The developers have also recreated the voices of many of these popular characters, although some sounding a little strange than the original voices but needless to say, it's a great effort. All the sounds of the worlds and combat have also been professionally recreated by Squaresoft to assist with the already perfect gameplay and graphics of the title. In conclusion, Kingdom Hearts II is a worthy sequel of the original game that once again features two amazing universes with easily one of the most professionally designed games of the year that I would recommend to all lovers of the first title. Even if you've never played the first game, you better still check it out! Highly Recommended!